Ted Brown Music in Puyallup has a full time in-house repair technicians ready to service all of your instrument repair needs. Whether you just need a simple adjustment or a complete rebuild, our technicians are fully equipped to handle whatever ailments your instrument may have. We are also the warranty service location for all the band and orchestra instruments we sell, and will coordinate any warranty work on everything else. If your instrument isn’t working like it used to, let us know and we’ll get it playing like it should. Need a repair? Send us a message. Tell us what you need repaired, plus a little about yourself, and a repair tech will be in touch soon. 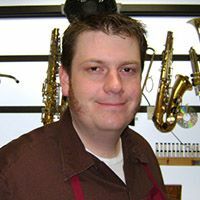 Matt Stevens started work in the repair shop at Ted Brown Music in Tacoma in 2008. When the new Puyallup store opened later that year, Matt moved there to take over the repair work. Before moving to Washington, Matt spent 8 years at various music stores in and around Reno, Nevada, including a four-year apprenticeship at Carpenter’s Music World under Jason Kilburn. Though Matt’s primary instrument has been the trumpet, he spends his time playing drums now. The opportunity to help people play music they want on an instrument that looks good and sounds better is Matt’s favorite things about repair work.